On this date in 1943 the Royal Air Force Bomber Command under Arthur “Bomber” Harris launched the air­borne Battle of Berlin, which lasted through March 1944. Harris believed the aerial assault on Berlin—if it came any­where close to Ham­burg’s ter­ri­fying de­struc­tion the previous July (Opera­tion Gomor­rah)—could be the blow that broke Ger­man resis­tance. “It will cost us between 400 and 500 air­craft. It will cost Ger­many the war,” he pre­dicted. The cam­paign period was not limited to attacks solely on Berlin, which endured 16 mas­sive attacks. 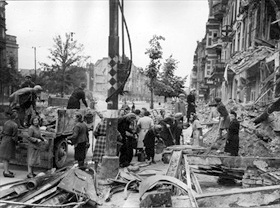 Other Ger­man cities were attacked, too, to pre­vent the con­cen­tra­tion of defenses in Berlin. The Novem­ber 18 raid by 444 RAF bombers did little damage to the Ger­man capi­tal, but the second major raid on the night of Novem­ber 22/23 proved to be the most effec­tive raid on Berlin of the war. Hun­dreds of Brit­ish and Cana­dian Lan­casters, Stir­lings, and Hali­faxes dropped 2,300 tons of bombs in 30 minutes, killing 2,000 Berliners and ren­dering 175,000 home­less. It was during this raid that the land­mark Kai­ser Wil­helm Memo­rial Church was de­stroyed. The following night 1,000 were killed and 100,000 rendered home­less. Regular raids in Decem­ber 1943 and Janu­ary 1944 killed hun­dreds of people each night, leaving 20,000 to 80,000 home­less each time. 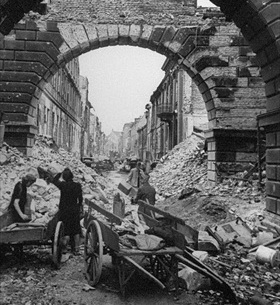 That said, reducing Germany’s largest city to a pile of rubble from the air never de­livered the war’s knock­out blow that RAF Bomber Com­mand pre­dicted it would. After a cumu­lative loss of nearly eleven hun­dred air­craft, almost all of them four-engine bombers (5.1 per­cent of the sorties dis­patched), Harris called off his air offen­sive. In words of the offi­cial RAF his­tory, “In an opera­tional sense the Battle of Berlin was more than a fail­ure, it was a defeat.” Amer­i­can bombers picked up the slack by making hours-long day­light raids on Berlin in the face of weak Luft­waffe defenses. Day­time raids espe­cially frightened Ber­liners because most were at work and thus some dis­tance from their usual cellars and their loved ones. Civil­ians liter­ally ran for their lives to escape de­struc­tion as bombs col­lapsed build­ings around them. On Febru­ary 3, 1945, the cen­ter of Berlin was sub­jected to a day­light drub­bing of unpre­ce­dented fury. But reducing the capi­tal of Hitler’s Thou­sand-Year Reich to utter rubble was left to the Red Army and its remorse­less heavy artil­lery shelling in April 1945. 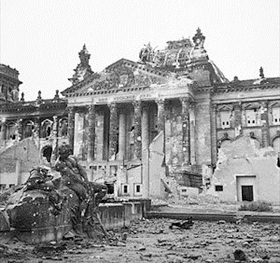 Left: The German Reichstag shows the scars of battle in mid-1945. The Reichs­tag had not been restored by the Nazis since the 1933 fire that gutted the inte­rior. The Red Army con­sidered it a prime tar­get in the April 16 to May 2, 1945, Battle of Berlin (aka the Ber­lin Stra­tegic Offen­sive Opera­tion as the Soviets called the final assault on Ber­lin), and artillery and tank fire each took its toll on the building. 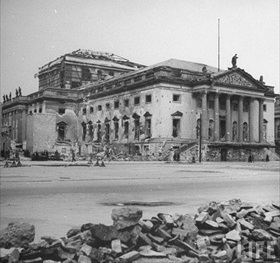 Right: The Staatsoper Unter den Linden (Berlin State Opera) was bombed in early 1941 but reopened in mid-Decem­ber, only to close again in August 1944 when the Gau­leiter of Berlin, Joseph Goeb­bels (also Propa­ganda Minis­ter), closed down Berlin and the rest of Ger­many in the name of “Total War.” The Staats­oper was once again destroyed on Febru­ary 3, 1945, in a fero­cious day­light raid that left much of Berlin’s city center a mass of rubble. 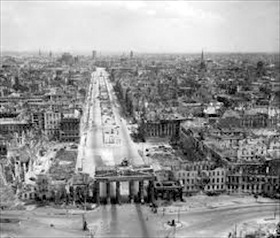 Left: An aerial photo of Berlin shows the legacy of destruc­tion left by the war. 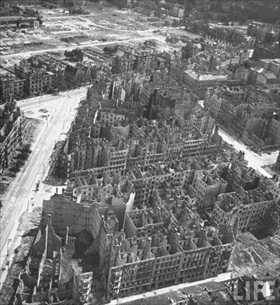 By April 1945 Berlin had become a moon­scape of ruined buildings and cratered streets. Right: Danish journalist Paul von Stemann remembered the end days of Berlin as a time of “dull­ness, anti­ci­pa­tion, fear and con­tinu­ous bombing. . . The war seemed per­pet­ual. . . The flowers had gone, the books had been burnt, the pic­tures had been removed, the trees had been broken, there were no birds singing, no dogs barking, no chil­dren shrieking . . . there was no laugh­ter and no giggling. . . [The sky] was often effaced by the stinking and greasy car­pets of volumi­nous black smoke.” Quoted in Moorhouse, Berlin at War, pp. 346–47. Left: Berlin’s premier street Unter den Linden in 1945 pre­sented a grim con­trast with the street’s prewar splendor. View is to the east. Right: Berliners had learned to clear streets following Allied bombing raids in the early days of the war. During the Battle of Berlin, many streets and side­walks were turned into rubble-fields and thou­sands of citizens were con­scripted afterwards to make them passable.